Bleu Cheese Bacon Dip…the recipe revealed! In 2008 at Salut! Wine Co. we rounded up a number of recipes for similar Bleu Cheese and Bacon Dip, combining them in different ways and serving them up at our Friday night wine tasting events to test each new iteration on the 50 or 60 guests in attendance. With each passing week, we got closer and closer to the right combination of ingredients and methods until this recipe was determined to be the best we could produce. We sold the fresh recipe in our store, so we didn’t let the secret recipe out of our hands…until now. Our Salut! Wine Co. Bleu Cheese Bacon Dip Recipe is now posted on our website at Salutwine.com! You’ll love the bold, creamy and savory flavors. For many of our guests, it created a new appreciation for Bleu Cheese! Whip a tiny portion of it with some fresh butter for a bit of extra creamy flair at a dinner event. Slice baked baby red potatoes in half (and slice a bit off the round end to allow it to sit without rocking), scoop out the middle with a melon baller, and put a dollop of dip in the middle for a wonderful appetizer! 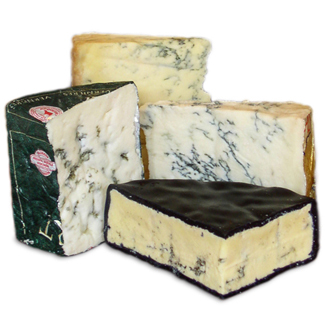 Check out Wikipedia for more information about Bleu Cheese, or visit some of the best local producers online: The Blue Heron French Cheese Company of Tillamook, Oregon, or Rogue Creamery of Southern Oregon. Find out How Bacon Is Made with this online video. Would you like to see how bleu cheese is made? Here’s a short 6 min. video from ifood.com!